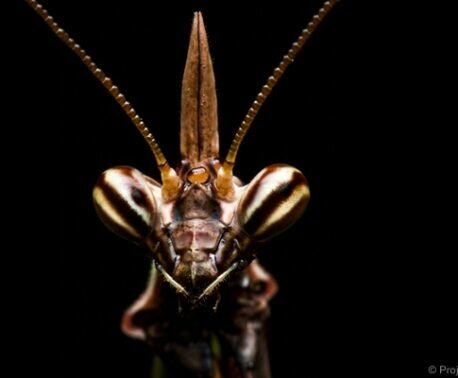 Insects are at the base of the food chain and are crucial to the Neotropics’ biodiversity. 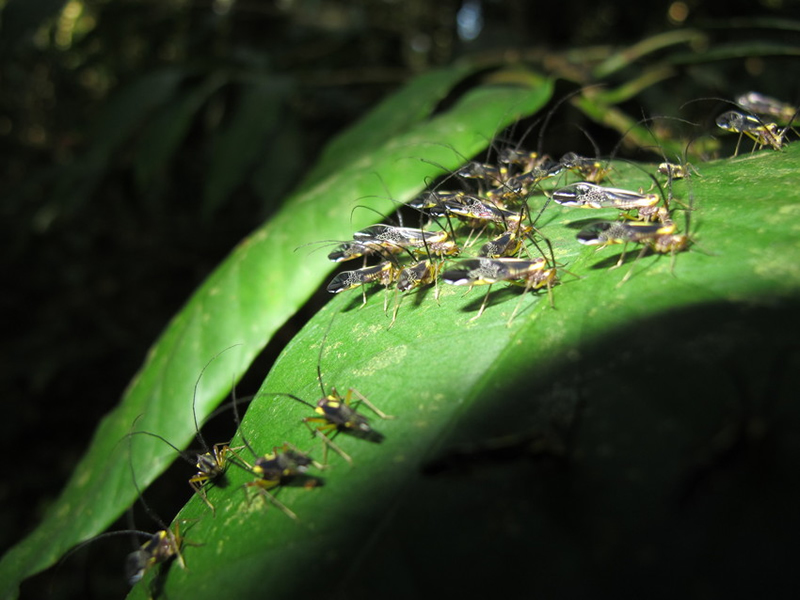 Researchers Jorge Bizarro and Andrew Proudfoot have been very busy looking for insects at the REGUA Reserve, a World Land Trust (WLT) funded nature reserve in Brazil’s Atlantic Rainforest. They describe the fascinating images they captured. Tortoise Beetle: Looking very powerful, the tortoise beetle (Cassidinae) is in fact small, shy and strictly vegetarian. It was seen in REGUA’s wetlands and its beautiful markings look like Egyptian hieroglyphics. Barklice: These gregarious insects live in groups and are known as Barklice (Psocoptera) because they live on trunks, feeding on fungus and lichens. Dragonhead Caterpillar: We were pleased to find a rare species of caterpillar (Archaeoprepona amphimacus) in the REGUA Reserve, living on a tree called the Cinammomum triplineiram. 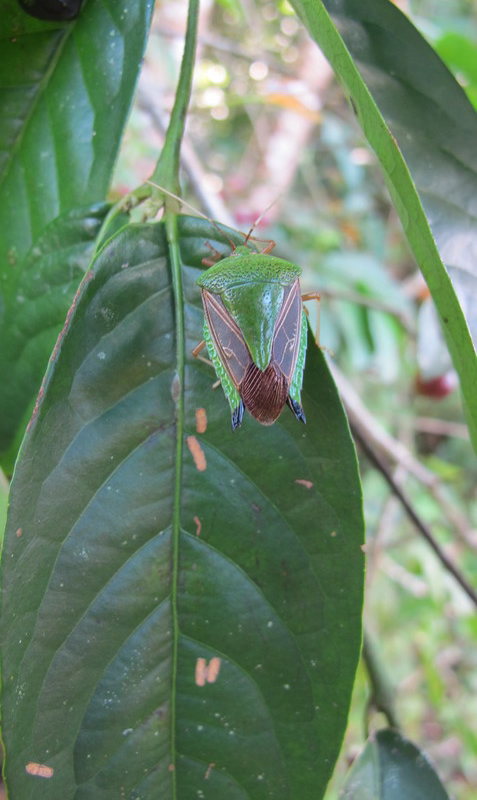 Curiously, both the tree species and insect are also found on the Bolivian Andean forest. The caterpillar is interesting as it looks like a small lizard with false eyes, similar to those of the enormous owl moth. This is a trick to frighten away predatory birds. It takes three to four months for the caterpillar to turn into a chrysalis to complete its metamorphosis. We were able to hatch the chrysalis and give it a breakfast before it took off for a new life. 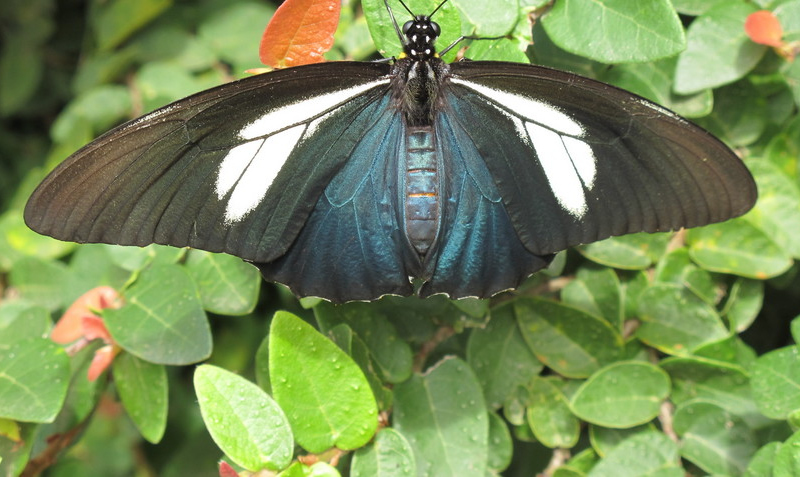 The butterfly, called a Prepona, is a fast flyer and if you visit these forests and see a medium sized metallic blue object darting past at high speed, then it would be a Prepona! 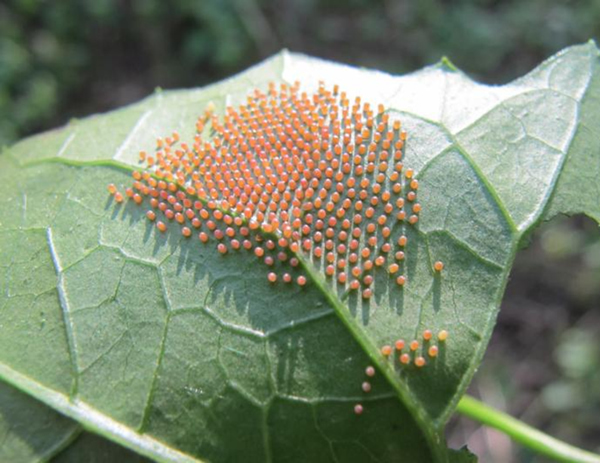 Actinote Eggs: Many butterflies are laying small gelatinous eggs on leaves for the new season, such as this Actinote sp on the Mikania sp plant. These are small, yellow-orange butterflies commonly found in Africa and the Neotropics. The African genus, Acraea, feeds mainly on passion fruit plants (Passifloraceae) while its Neotropical cousin feeds on Asteraceae plants. Silk Moth Caterpillars: Leaving the egg stage, these very young and active caterpillars are extremely hungry and are pictured eating the young leaves of Trema micrantha, a common plant found in REGUA’s reforestation area. We think these are silk moths (Hylesia sp of the Saturniideae family); they will turn into beautiful moths with false eyes on their lower wings. Most butterflies lay between 50 and 300 eggs while some moths can lay up to 3,000, such as the European Tiger moth (Arctia caja). It is estimated that only three to 10 per cent of this number reaches the adult stage. Parasitic wasps and flies account for the large loss, as well as hunting wasps, spiders and birds. Zaretis itys Caterpillar: This caterpillar hasd been attacked by Brachonid wasps in REGUA’s wetlands. The wasps found this unsuspecting caterpillar (Zaretis itys) and injected it with eggs, these produced maggots that ate their way out of the caterpillar, without truly killing it. 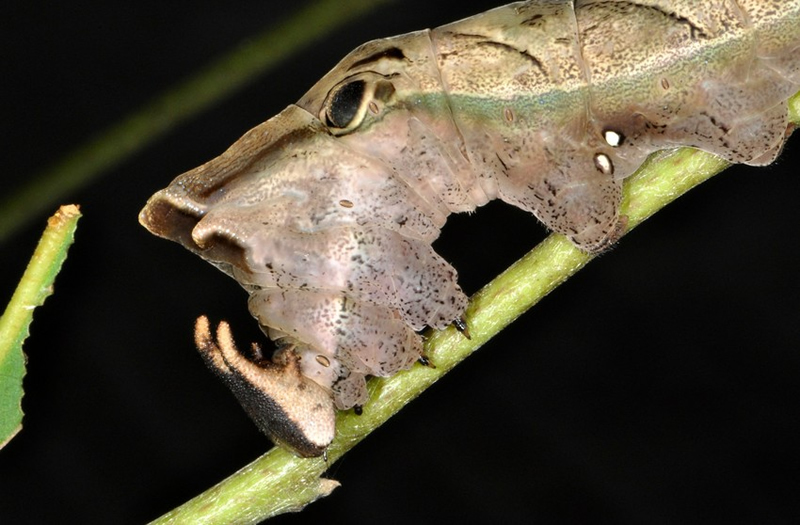 Then pupas (the stage in metamorphosis between the larva and adult) were formed outside its host, allowing the wasps to emerge and finally the caterpillar died. 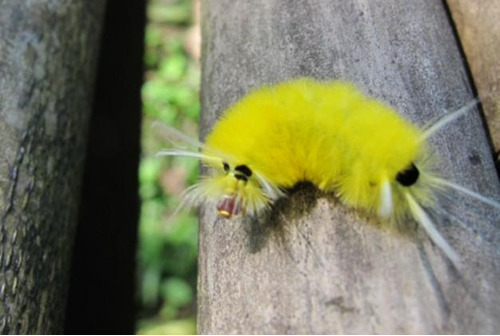 Lophocampo annulosa: We found this small furry yellow caterpillar by the wetlands in the reforestation area. This species is Lophocampo annulosa and its cocoon is a round ball made from its furry hairs; seemingly obvious but in fact very well camouflaged. This caterpillar will become a Tiger moth from the Arctiidae family, which have been poorly researched in the Neotropics. 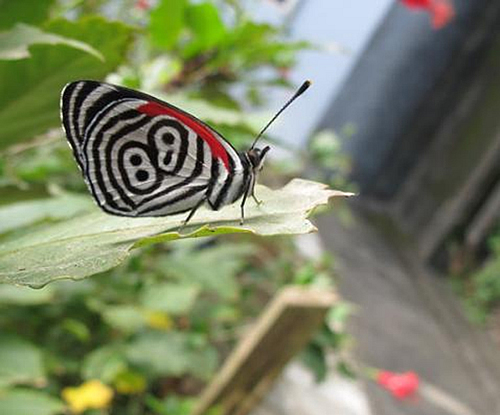 88 Butterfly: We also found many 88 butterflies, not to be confused with the 80 butterfly. It has a distinctive wing pattern and is a member of the Nymphalidae family. 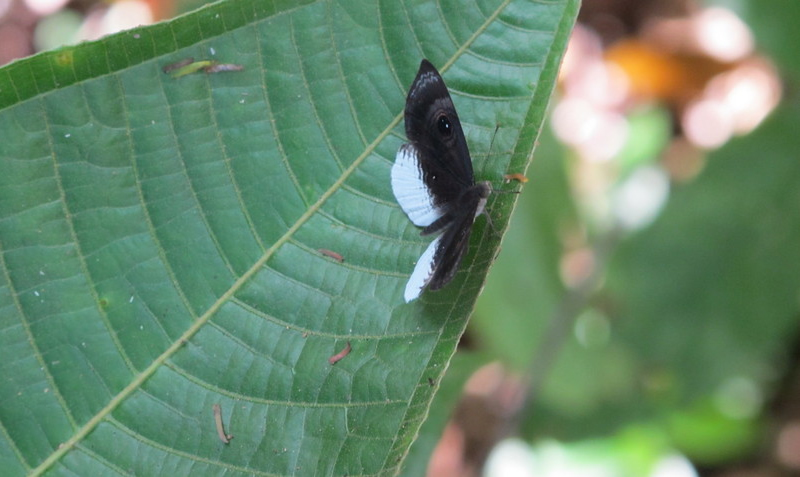 This butterfly (Diaethria clymena janeira) feeds on fermented fruit and Lantana sp flowers. Interestingly the sub species is slightly different, having darker wing markings from its southern cousin. 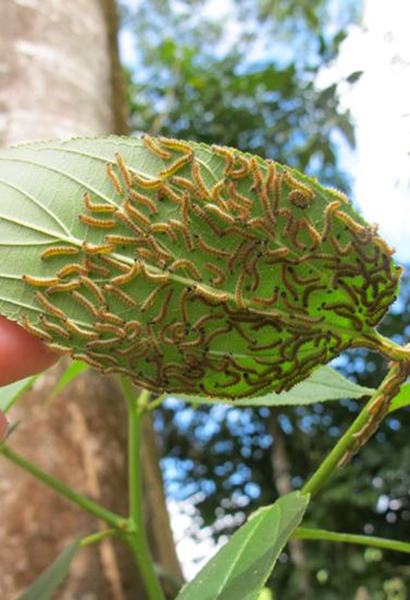 The young caterpillar is easy to find feasting on Trema micrantha trees in REGUA’s reforested areas and the local children love to rear them to their butterfly stage. Mesosemia nyctea fluminenis: This Metalmark species (Mesosemia nyctea fluminenis) is new to the REGUA Reserve. The species was discovered by the famous Austrian naturalist Joseph Zikan in 1942. The hind wing is white but Jorge, a butterfly expert, has noticed that summer individuals have brown streaks on this white wing, showing a seasonal variation. Troidini Swallowtail Butterfly: This is a recently emerged Troidini Swallowtail butterfly (Battus crassus), a distant cousin of the Indo-Australian Birdwing butterfly. Judging by its fat abdomen, it looks like a female. The caterpillars live on Aristolochia vines and it is an uncommon species in the south-east of Brazil’s Atlantic Rainforest. We found various examples by the reserve’s wetlands, indicating that a lot of chrysalises were successfully emerging. Shield bug: The locals don’t like the strong smell that comes from brushing off a Shield bug or Stink bug (Pentatomoidea hemipteroid of the Acanthosomatidae family). The bug appears to have a tunic underneath it which hides its collapsible wings. They hatch from eggs as a mini version of the adult, though lacking the wings. This species is common at the REGUA Reserve, in both open areas and in the forest. They feed on plant juices, sucked from the stem that leaves farmers concerned about the future of their crops. 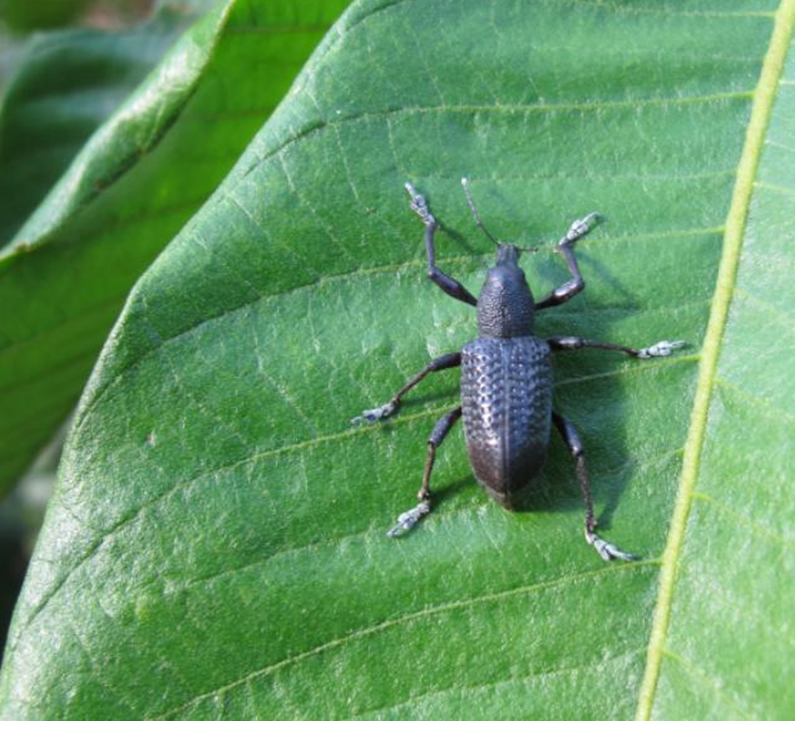 Weevil: Lastly we came across this weevil, from the Curculionidae family, living only on leaves by the wetland trail. This is a huge family, one of the largest of the beetle families and we can only hope that we can get to study them. 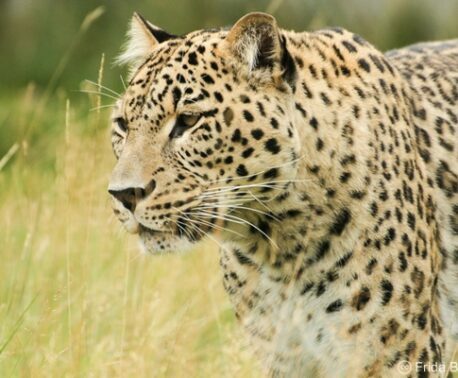 If you would like to see some of this fascinating wildlife, REGUA would be delighted to welcome you. For more information visit: www.regua.co.uk.